begins in 986 with the granting of a charter to the Benedictine monks of Westminster. There are no records of a church but it seems unlikely that the monks would have left the land long unused. The area seems to have been roughly that of the old Borough of Hampstead and much larger than the present parish. The first real references to a church begin in 1312 when John de Neuport was priest and in 1333 when a Chapel dedicated to the Blessed Virgin Mary is recorded. With the dissolution of the monasteries under Henry VIII the Benedictine foundation of Westminster disappeared and was replaced by the Bishopric of Westminster under Thomas Thirlby who was also rector of this church. He appointed Thomas Chapelyne as Vicar in 1545. In 1551 Edward VI suppressed the see and granted the manor and benefice of Hampstead to Sir Thomas Wrothe. A list of incumbents can be found in the porch and the Parish Records run continuously from 1540. A gravestone preserved within this building records one John Rixton who died in 1658 leaving a bequest to provide bread for the poor. The stone is in the north transept, the Bread Cupboard in the Chapel beyond. 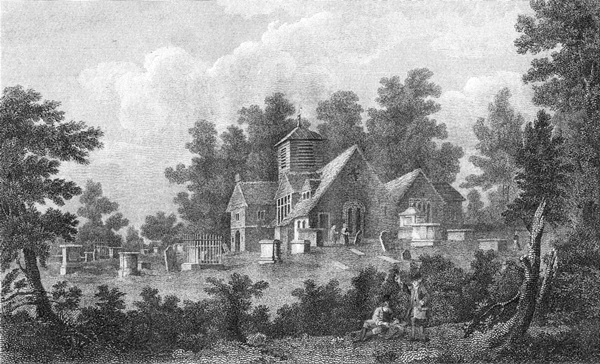 As Hampstead expanded, growing steadily more popular for its clean air and elevated position people came to take the waters from the well in Well Walk and it was much patronised by the rich and famous - so much so in fact that the chapel became inadequate for the needs of the growing population and plans were put in hand to build a new church. Pictures show the church at this time to be part stone, part timber, with a small wooden tower - rather a jumble in fact - picturesque but small and, by 1744, in so dangerous a condition that people hesitated to use it. Clearly it was time for a change. The Trustees first petitioned Parliament for £2,500 to assist in the rebuilding but were rejected. The Lord of the Manor granted £1,000 and the rest had to be raised by public subscription, by mortgaging the offertory and by charging pew rents - a custom only abolished in 1960 with the advent of Christian Stewardship. (There were always some free seats for the poor.) Pews were designated by means of small brass name holders, all but one of which were removed when the church was redecorated in 1985. This lone sample can be found in the north aisle, about half way down, on the pew belonging to E. V. Knox, editor of Punch. The first architect approached was Henry Flitcroft who offered to put in a plan for the new church free provided he had no competition but "in the Case of a Competitor he would have nothing to do with it". The Trustees resolved that "no person refusing to have a Competitor shall be Employed as surveyor in building of Hampstead New Church" and Flitcroft withdrew. He did, however, give £25 towards the building of the new church and was awarded pew No.10. The Trustees finally chose John Sanderson, although they argued with his original design and finally chose plan No.3 with the steeple at the East end - a cheaper construction as the land fell away sharply to the west. The tower was to cause much controversy - the design was changed in 1759 and evidence of subsidence can be seen on the outside northwest corner, said to be the result of the use of Purbeck stone rather than Portland [which premise is hotly disputed by the quarrymen of Purbeck who maintain it’s just as good!] The copper spire was added in about 1783. 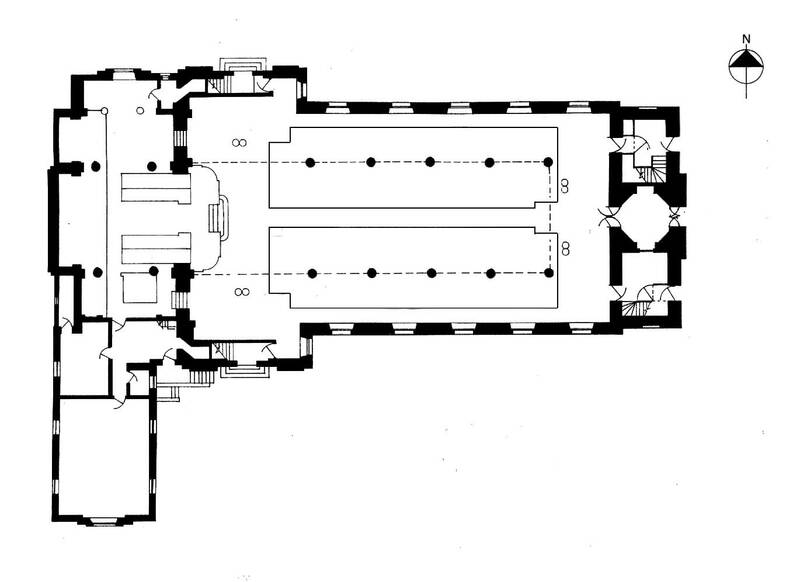 The church at that time was much smaller than it is today, extending only as far as the transepts - a simple rectangle. The village lying to the east of the site, the congregation entered by two doors either side of the main altar; the centre door did not exist, the area under the tower being the vestry. The door in the west end of the church and terraces, intended as the 'main' entrance, were largely unused, except by the Lords of the Manor. There has always been a gallery. The church was consecrated on 8th October 1747 by the Bishop of Llandaff (as commissary of the Diocesan) with a dedication to St John - sadly no one thought to specify which St John although in 1917 the then Bishop of London declared it to be the Evangelist. 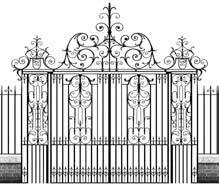 The gates and railings came from Canons, the Duke of Chandos' home, where Handel was organist. 59ft of railings and two 9ft gates were purchased and altered to fit the front of the church. By 1827 the church was too small to accommodate the growing population - it could seat 1,052 and the population of the parish had swelled to some 8,000 inhabitants, many of whom needed free seats. Repairs were also desperately need. Not until 1843 was an acceptable plan drawn up, by Robert Hesketh, to extend the church 30ft westwards by means of transepts, providing 524 extra seats. 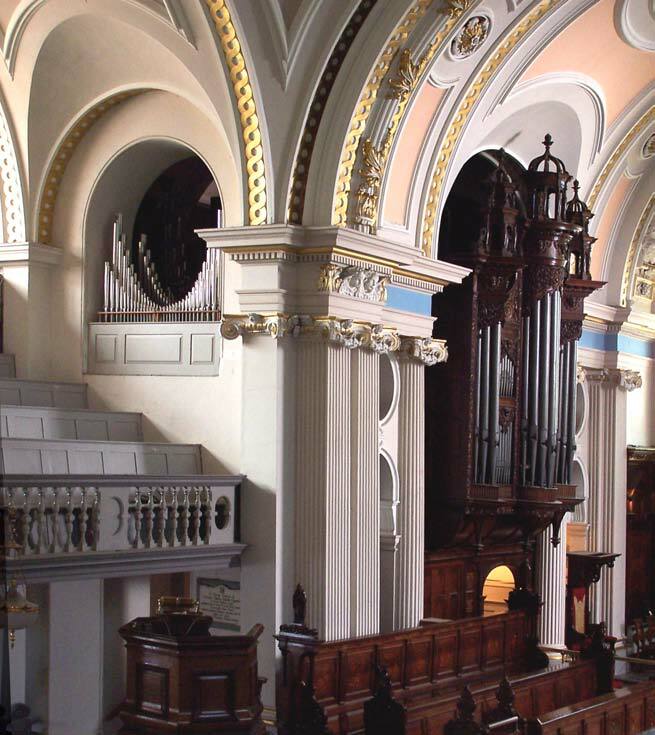 Gas lighting was installed and in 1853 the first Willis organ was built, Henry Willis himself being employed as organist. In 1871 suggestions were again made for 'beautifying and improving' the church. Once again endless arguments ensued - not least on the proposal to demolish the tower which gave rise to a petition signed by the cream of artistic and literary London - William Morris, Edward Burne-Jones, Holman Hunt, Ford Madox Brown, Anthony Trollope, George du Maurier, Coventry Patmore, F. T. Palgrave and others. The Trustees gave in and the church was extended westwards in 1877-8 under plans drawn up by F.P. Cockerell. The inside was realigned, the altar being removed to the west end, the pillars from the original sanctuary being incorporated into the new reredos. The pulpit was repositioned, though it was lowered and the sounding board removed. This building was consecrated on 1st June 1878 by the Bishop of London. The Father Willis organ, installed in 1884, has been much altered over the years and work completed in 1997 has restored it more nearly to the original Willis sound, incorporating modern technology and making a versatile instrument suitable for a variety of uses. The series of stained glass windows in the upper and lower nave were designed by Clayton and Bell, the West windows by Ellis Wooldridge; the window in the chapel of St Mary and St John, by Joanna Fulleylove, is dedicated to a soldier of the 1st World War. The window over the main door depicting the Road to Emmaus was designed by Mary Temple Moore (whose memorial can be found at the foot of the chancel steps) and installed by Reginald Bell, in 1929. The engraved glass doors were given in 1995 in memory of Rosemary, Lady Goodison. A sprig of rosemary is incorporated into the design around the handle. The Lamb and the Eagle symbolise St John the Baptist and St John the Evangelist respectively and, like the stained glass windows over the altar, indicate the church's ambivalence about which St John the dedication refers to. Alan Goodison’s name was added following his death in 2006. The design of the doors was conceived and carried out by Tony Gilliam. The choir stalls were funded by Reginald Prance and designed by T. G. Jackson. Prance financed a large part of the chancel and made a significant contribution to the building fund. Since Henry Willis was not noted for the excellence of his organ cases we are particularly fortunate that T.G. Jackson designed the organ case as a unit with the choir stalls. Made of walnut the case adds an elegant touch to the chancel. The font by the east door, symbolising entry into the Church by Baptism, incorporates the bowl of the 1745 font, the stem being removed to form the piscina in the chapel (not now used as it was found to drain into one of the newly constructed rooms in the Crypt! ); a dedication to George Augustus Selwyn, first Bishop of New Zealand, is placed immediately above the piscina. In 1911-12 a new architect, Temple Moore, drew up designs for improving the Vestries and adding a Morning Chapel, now the Sacrament Chapel, dedicated to St Mary and St John. It was during these alterations that the Royal Arms were rediscovered and rehung on the east gallery. The large prie-deux in the chapel were given in memory of Mildred Aline Bell who died on the Matterhorn in 1901 and who is buried in the Churchyard. In 2012 a new clergy vestry was built in the north side of the Sacrament Chapel with money donated by parishioners. The glass doors match the style of the main doors and commemorate relatives of the donors. Decoration in the church was for many years ornately Victorian and very dark. The new lighter scheme adopted in 1958 gives more of an impression of the lightness of the church in 1747 when it was largely whitewashed. In 1964 and 1989 rooms were added in the arcading under the west end of the church to accommodate our expanding Sunday School and provide parish rooms for a multiplicity of uses. These were extensively refurbished in 2009. Many of the altar frontals in use today were worked by Miss Barbara Thomson who also masterminded the replacement of the hassocks, coordinating a team of parish volunteers. The South Chapel, for many years unused, has now been re-instated with a cross in memory of John and Rotha Barnfield and a laudian and set of altar panels in memory of Lady Willmer. The votive candle stand is kept in this chapel, along with a prayer board where visitors can leave requests for prayers. Information about memorials in the church can be found in the Tomb Trails - the most notable being the bust of John Keats, carved by Miss Anne Whitney of Boston, Massachusetts, and donated in 1894 by American admirers of the poet. Keats lived for some time in Hampstead before going to Rome where he died. Other Tomb Trails cover the Old Churchyard and the Additional Burial Ground over the road. A full History of the Parish Church is available (£5).